Ah articulates a simple paradox of reading animated digital literature, which is that the eye, and by extension the mind, often has no sense of the future of a sentence or line of text and, more importantly, is not given the chance to re-read an already witnessed word or phrase. Young-Hae Chang Heavy Industry's Dakota is a perfect illustration of this principle. In Ah, the central object of rumination is Einstein, but just as the physicist pondered the numberless variations between the presence of a "1" and "0," this Flash animation brings us back and forth between clever articulations and the ambiguous expressivity of single letters and syllables. 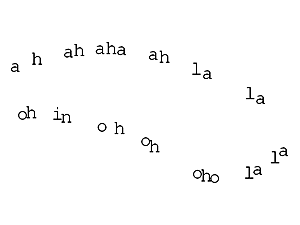 Author description: The starting-point of Ah (a shower song) is a text that moves between breathing and singing, representing the flow of time. Words glide in and out of each other in a way that reminds us of respiration, or of the "stream of consciousness" of somebody standing in the shower whose thinking and poems (singing) about the unfolding of time flow almost iconically into each other. It's almost as if the reader is allowed passivity, but the reader's role changes. The endless loop of the work forces the reader to adjust his or her reading and interpretation strategy. Previous publication/additional credits: Appeared 2008 on the Poetry International Weblog. Ah (a shower song) was translated from Dutch into English by Paul Vincent.